A homeopathic remedy for seasonal affective order. Melancholy improvisations with Marilyn Crispell and Carmen Castaldi. A Nashville ditty about living large on the cheap. I write weekly concert previews for The Kansas City Star and Ink. Oliver Mtukudzi has died. I haven’t given the Zimbabwean much consideration in recent years, but I spent many blissful hours listening to his soothing music in the 1990s. My first Qawwali concert experience couldn’t have taken place in a more auspicious setting. 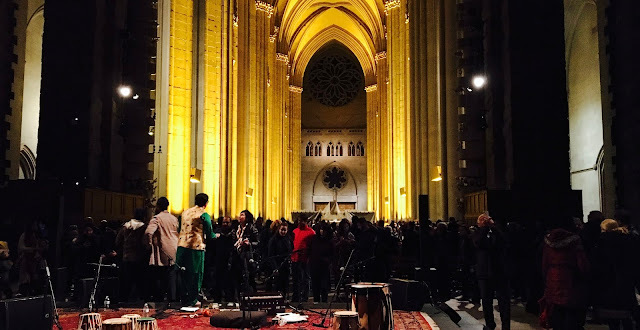 I took in a transcendent performance by Riyaaz Qawwali at the Cathedral of Saint John the Divine on Saturday, January 19. About two-thirds of the audience of approximately 500 were Desi, but their responses to the devotional Sufi music weren’t uniform. Some closed their eyes and assumed solemn postures of prayer. Others stood and gesticulated wildly. The boldest move, however, consisted of cavorting to the front of the stage and flinging money at the musicians with dramatic flourishes. Overwhelmed by the swirling echoes in the world’s largest cathedral, I was sympathetic to all three delirious reactions. Sonny K. Mehta, the leader of the Texas based group, humbly suggested that Riyaaz Qawwali was simply striving to honor the tradition established by Qawwali greats such as Nusrat Fateh Ali Khan. Had the group been any better, I might have died of excessive beatitude. I shared my thoughts on Al Foster’s 75th birthday party at the New York City jazz club at Plastic Sax. Toro y Moi’s insistently uplifting Outer Peace sounded amazing in the subterranean Harlem rental I occupied during my trip to New York City. Here’s “Freelance”. I don’t know if I’ve gone soft or if James Blake has simply veered into territory that’s more appealing to me, but Assume Form is easily my favorite album by the art-pop innovator. Here’s “Here’s the Catch”. The Motet’s Death or Devotion is an outstanding homage to funky R&B acts like Tower of Power and Bobby Caldwell. Here’s “Highly Compatible”. Skronk doesn’t get much groovier than What Is To Be Done, an invigorating collaboration between saxophonist Larry Ochs, guitarist Nels Cline and drummer Gerald Cleaver. Like a full-fledged creep, I examined a stack of confiscated homemade signs near one of the entrances of Silverstein Eye Centers Arena last night. 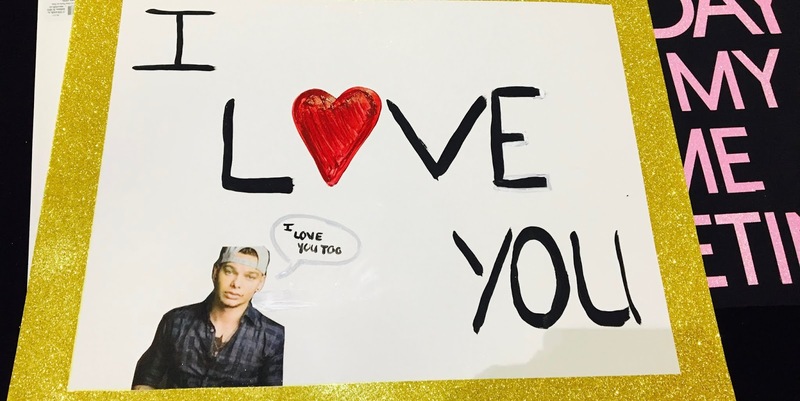 The children and teens who created the fan art must have been devastated upon learning that the symbols of their devotion wouldn’t be seen by the headliner Kane Brown. Friends and colleagues have long asked me how I suffer through concerts by mainstream country artists, facile pop stars and over-the-hill rockers. I respond to their queries with indignant disbelief. Seeing joy on the faces of fans and hearing their unreserved screams of appreciation never fails to thrill me. I unreservedly adored last night’s concert by Brown, Granger Smith and Lacy Cavalier. I reviewed the show for The Kansas City Star. I’m not quite sure how or why, but I’ve always been aware of Carol Channing. She died earlier this week. Lorna Doom of the punk band Germs has died. My ongoing appreciation of Future’s druggy, vulgar materialism shames me. Even so, I'm willing to confess that I’ve already derived enormous pleasure from the new release Future Hndrxx Presents: The Wizrd. I’ve coveted the 21-CD box set collecting the works of the Art Ensemble of Chicago and affiliated ECM Records projects since its release six weeks ago. I own physical copies of just a handful of the titles, but catching the group twice in the early 1980s transformed me from a curious listener to a fully committed jazz enthusiast. The inability or unwillingness of subsequent jazz-oriented acts to attempt similar sorts of outlandish showmanship and surprising improvisations is an ongoing letdown. The late Lester Bowie commanded most of the attention, but Joseph Jarman was one of the group’s most vital members. The saxophonist died last week. I created an audio profile of the Kansas City producer and engineer Justin Wilson for KCUR. I reviewed a performance by Ben Tervort, Matt Otto and Brian Steever at Plastic Sax. Trombonist Urbie Green died on New Year’s Eve. I adore Liz Brasher. It’s a drag to report that her debut album Painted Image consists of warmed-over soul. 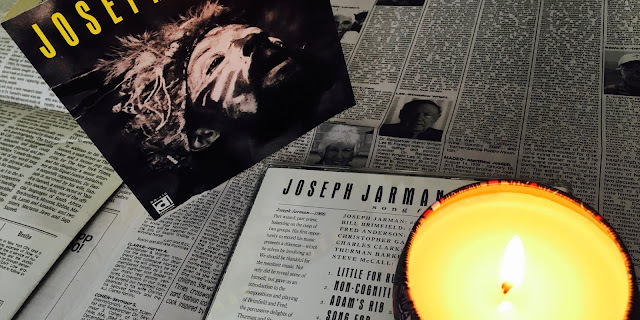 RIYL: (forgettable) Shelby Lynne, disappointment, (generic) James Hunter. Chris Potter, James Francies, Eric Harland and Linley Marthe? Oh man. Circuits will be released on February 22.